The Milwaukee Brewers are an American professional baseball team based in Milwaukee, Wisconsin. The team is a member of the Central Division of Major League Baseball's National League (NL). The team is named for the city's association with the brewing industry. 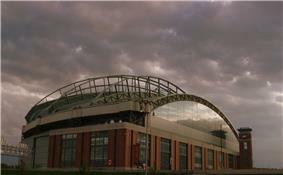 Since 2001, the Brewers have played their home games at Miller Park, which has a seating capacity of 41,900. The team was established in 1969 as the Seattle Pilots, an expansion team of the American League (AL), in Seattle, Washington. The Pilots played their home games at Sick's Stadium. After only one season, the team relocated to Milwaukee, becoming known as the Brewers and playing their home games at Milwaukee County Stadium. In 1998, the Brewers joined the National League. As of the completion of the 2014 regular season, the Brewers have played in 7,319 regular season games, compiling a win–loss record of 3,501–3,818 (.478). The team's only World Series appearance came in 1982. After winning the AL Championship Series against the California Angels, the Brewers faced off against the St. Louis Cardinals in the World Series, losing 4-3. In 2011, the Brewers won the NL Division Series versus the Arizona Diamondbacks 3–2, but lost in the NL Championship Series to the eventual World Series-champion Cardinals, 4-2. Originating as an expansion team in 1969, in Seattle, Washington, as the Seattle Pilots, the club played for one season before being acquired in bankruptcy court by current MLB Commissioner Bud Selig, who then moved the team to Milwaukee. The Brewers were part of the American League from their creation in 1969 through the 1997 season, after which they moved to the National League Central Division. Milwaukee had previously been a National League city when its team was the Milwaukee Braves (1953–1965). In 1982, Milwaukee won the American League East Division and the American League Pennant, earning their only World Series appearance to date. In the Series, they lost to the St. Louis Cardinals, four games to three. In 2008, for the first time in the 26 years since their World Series appearance, the Brewers advanced to postseason play by winning the National League wild card. They were eliminated in the National League Division Series by the eventual World Series champion Philadelphia Phillies. 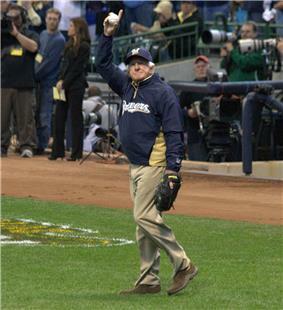 On September 23, 2011, the Milwaukee Brewers clinched their first division title in 29 years. They won the National League Division Series in five games over the Arizona Diamondbacks, but lost the National League Championship Series. to the eventual World Series champion St. Louis Cardinals in six games. The original Brewers uniforms were "hand-me-downs" from the Seattle Pilots. Since the move to Milwaukee received final approval less than a week before the start of the season, there was no time to order new uniforms. Selig had originally planned to change the Brewers' colors to navy blue and red in honor of the minor league American Association's Milwaukee Brewers, but was forced to simply remove the Seattle markings from the Pilots' blue-and-gold uniforms and sew "BREWERS" on the front. However, the outline of the Pilots' logo remained visible. The uniforms had unique striping on the sleeves left over from the Pilots days. The cap was an updated version of the Milwaukee Braves cap in blue and yellow. Ultimately, it was decided to keep blue and gold as the team colors, and they have remained so ever since. The Brewers finally got their own flannel design in 1971. This design was essentially the same as the one used in 1970, but with blue and yellow piping on the sleeves and collar. In 1972, the Brewers entered the double-knit era with uniforms based upon their flannels: all white with "BREWERS" on the front and blue and yellow trim on the sleeves, neck, waistband, and down the side of the pants. This is the uniform that Hank Aaron wore with the club in his final seasons, and that Robin Yount wore in his first. During this period, the logo of the club was the Beer Barrel Man, which had been used by the previous minor league Brewers since at least the 1940s. The Brewers unveiled new uniforms for the 1978 season. The uniforms featured pinstripes with solid a blue collar and waistband. The road uniforms continued to be powder blue, but for the first time the city name, "MILWAUKEE", graced the chest in an upward slant. In addition, this season saw the introduction of the logo that was to define the club: "M" and "B" in the shape of a baseball glove. The logo was designed by Tom Meindel, an art history student at the University of Wisconsin-Eau Claire. The home cap was solid blue, and the road cap was blue with a yellow front panel. Additionally, their batting helmets had a white front panel. The club wore these uniforms in their pennant-winning season of 1982. Only minor changes were made until 1990; the color of the road uniforms changed to gray in 1985, while the blue-yellow-blue road cap was abandoned the following year, as were the white front panel batting helmets. In 1990, the Brewers made significant modifications to their uniforms, switching from pullover to button-down jerseys (the last American League team to do so). Their individual uniforms showed other changes as well; at home, the blue piping was removed and the block lettered "BREWERS" was changed to a script version similar to the script used on road uniforms, while those outfits had their piping changed from blue-yellow-blue to blue-white-yellow. In 1994, in collaboration with the Brewers celebrating their 25th year in baseball, the team did a radical makeover of their uniforms. The ball-in-glove logo was removed and replaced with a stylized interlocking "M" and "B" set on a pair of crossed bats and a diamond background. The royal blue changed to navy blue, while the yellow changed to a metallic gold. Forest green was added as a third color. The jerseys swapped pinstripes for retro-themed piping around the collar, buttons, and sleeves, following a trend that was popular in the 1990s. The uniforms' lettering had the same style of letters as the new cap logo with heavily stylized "BREWERS" lettering on the home jerseys and "MILWAUKEE" on the road grays. For the first time, an alternative jersey was introduced. It was navy blue with the home "BREWERS" lettering on the front and featured the Brewers' logo on the lower left side. These uniforms were also the first in franchise history to have the players' last names on the back. The home cap was completely navy blue, while the away cap featured a navy blue upper and a forest green bill. In 1997, the uniforms were slightly modified, with the main logo being removed from the caps and replaced with an "M" and the alternate jersey was discontinued. All navy caps were worn with both the home and away uniforms, while the away green socks were changed to navy blue. Before the 2000 season, to coincide with the anticipated opening of Miller Park, the Brewers changed their uniforms again. The block letters on the front were replaced with "Brewers" in a flowing script, and green was removed as the third color. The cap logo was a script "M", similar in style to the Miller logo, with a head of barley underlining it, symbolizing Milwaukee's beer-making industry. The home uniforms also featured a patch on the left sleeve consisting of the cap logo with a gold outline of the state of Wisconsin behind it, showing the Brewers statewide appeal. The road uniforms were grey and featured the same script "Brewers" on the front, with a simple patch on the left sleeve bearing a script "Milwaukee". There was also an alternate navy blue jersey that had the same features as the home jersey. Although the uniforms were supposed to debut with the opening of Miller Park, the Big Blue crane collapse in July 1999, which cost the lives of three workers and caused damage to the first base side of the stadium, delayed the opening of Miller Park for one year, so the uniforms actually debuted at Milwaukee County Stadium in the ballpark's final year. In 2005, the Brewers introduced Retro Sundays, when the Brewers would wear uniforms featuring the "ball-in-glove" logo. The uniforms are similar to the uniforms worn from 1978 to 1989, but with some modern modifications, such as the uniforms being button-up instead of pullover, displaying players' last names on the backs of the jerseys, and a "ball-in-glove" logo patch on the left sleeve. In 2007, the Retro day was changed from Sunday to Friday, though they may also be worn outside of those days if a starting pitcher chooses the retro uniforms to wear during his start. In 2010, the Brewers debuted a new alternate road jersey which, like the other alternate jersey, is navy blue, but bears a script "Milwaukee" on the front. In 2013, a gold alternate jerseys with "Brewers" on the front was added, as well. During the off-season before the 2013 season, the Brewers allowed fans to design their own Milwaukee Brewers uniforms. Three finalists were chosen, which fans were given the opportunity to vote for their favorite through the Brewers website. The winning uniform was designed by Ben Peters of Richfield, Minnesota, and was worn by the Brewers for two spring training games. Three Brewers have won MVP awards during their career with the team. While in the American League, Rollie Fingers won the award in 1981, and Robin Yount received the honor in 1982 and 1989. Ryan Braun won the National League MVP award in 2011. Two pitchers have won the Cy Young Award in the American League. Rollie Fingers won in 1981, and Pete Vuckovich won in 1982. Two players have been named Rookie of the Year. Pat Listach won the American League's award in 1992, and Ryan Braun won the National League award in 2007. The following inducted members of the Baseball Hall of Fame spent some or all of their careers with the Brewers. In addition to the five numbers retired by the Brewers, the number 50 has been placed in the Brewers' Ring of Honor for Bob Uecker and his half-century in baseball. Though not retired, number 17 has been kept out of circulation since Jim Gantner's retirement in 1992. The only time it was issued after 1992 was from 1996 to 1997 when he returned as first base coach. Uniform number 1 is pending retirement to honor the former owner who brought baseball back to Milwaukee, Bud Selig. The records of the Brewers' last five seasons are listed below. 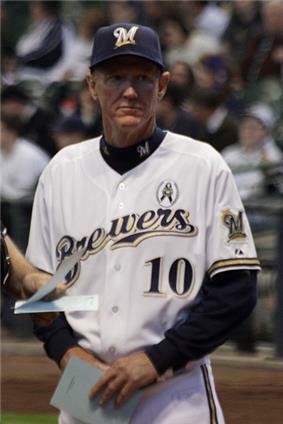 Ron Roenicke has managed the Brewers since 2011. Through 46 seasons of play, the Brewers franchise has employed 18 managers. The records and accomplishments of the last five Brewers' managers are shown below. # A running total of the number of Brewers managers. Any manager who has two or more separate terms is only counted once. The Brewers' flagship radio station is WTMJ (620 AM). Bob Uecker, a winner of the Ford C. Frick Award from the Baseball Hall of Fame, joined the Brewers in 1970, when the team moved from Seattle, and has been there ever since. Alongside Uecker is Joe Block, who joined the team's radio broadcast in 2012. Block replaced Cory Provus who had left to become the Minnesota Twins lead broadcaster on radio after the 2011 season. Provus, formerly of WGN radio in Chicago, replaced Jim Powell, who left Milwaukee for the Atlanta Braves radio network. Powell in turn replaced Pat Hughes, who departed to do play-by-play for the Cubs on WGN in 1996. The Brewers radio broadcasts usually feature a 2-2-2-1-2 format where Uecker does solo play-by-play for the first, middle and last 2 innings, while Block does innings 3-4 and 7, and both doing analysis throughout and varied presentation for extra innings games. Starting with the 2014 season Uecker cut back on the amount of road games he works due to health concerns, mainly involving West Coast trips and distant road games in Colorado and Atlanta; Block handled the play-by-play, with former Brewer and Met Darryl Hamilton on color for the first series at Atlanta. Select daytime home games are broadcast in Spanish over Waukesha-licensed ESPN Deportes Radio affiliate WRRD (1510), which is restricted to operating during daytime hours, with Andy Oliveras serving as play-by-play announcer. 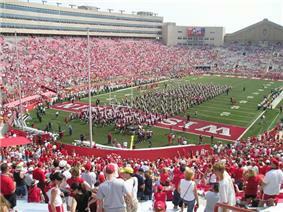 Most of the team's television broadcasts are aired on Fox Sports Wisconsin. Brian Anderson, who has worked on The Golf Channel, took over as the Brewers' play-by-play announcer for the 2007 season. He replaced Daron Sutton, who joined the Arizona Diamondbacks. The color commentator is Bill Schroeder, a former major league catcher who played six of his eight seasons for the Brewers. As of 2014 Schroeder is in his 20th season as the Brewers' color commentator. 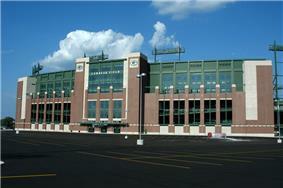 The 2010 season was the first year where all of Fox Sports Wisconsin's games were broadcast in high definition. Anderson (who also is a part of TBS's playoff coverage) also provided play-by-play for the 2011 NLCS due to Ernie Johnson stepping aside for the year due to a medical situation with his son. In 2014, as Anderson's Turner Sports duties have increased along with the addition of NCAA college basketball and NBA on TNT play-by-play duties, Wisconsin Badgers football and men's college basketball radio announcer Matt Lepay served as play-by-play man on days when Anderson was working for Turner. From 2007-2011, the Brewers and FSN Wisconsin subcontracted to Weigel Broadcasting a package of 15 games and one spring training game over-the-air on WMLW (then-Channel 41/58.2) in Milwaukee each season with FSN Wisconsin producing the telecasts and Weigel selling air time for each of those games and additional games added depending on weather postponements and pennant race standings (WMLW games would air on the outstate FSN Wisconsin network for the remainder of the state). The deal was ended before the 2012 season in order to facilitate full-season HD coverage on FSN Wisconsin and distribution complications. Weigel continues to air a few Sunday home broadcasts per year with Spanish language play-by-play on Telemundo affiliate WYTU-LD (Channels 63/49.4), which produces their own broadcasts using FSN's camera positions with Hector Molina on play-by-play and bilingual WDJT sports anchor Kevin Holden on color. Five of the six major network television stations in Milwaukee, along with WMLW, have carried game broadcasts over the years, with WTMJ-TV being the original broadcaster in the 1970s. WVTV carried the team for the bulk of the 1980s and early 1990s, with WCGV-TV following from 1994 until 2004, and WISN-TV carrying select Sunday games at the beginning of the 2000s. WITI is the only station not to have carried local coverage of the team through its history (though former WITI sports anchor and current Bucks play-by-play man Jim Paschke was the team's TV announcer during its time with WVTV), although it has aired national games from CBS and Fox involving the Brewers through the years. ^ a b "Brewers Timeline". MLB.com. ^ McCalvy, Adam. "Finalists announced for designing Brewers uniform". MLB.com. Retrieved 15 January 2013. ^ a b "Most Valuable Player MVP Awards & Cy Young Awards Winners". Baseball-Reference.com. Sports Reference LLC. Retrieved June 19, 2014. ^ "Rookie of the Year Awards & Rolaids Relief Award Winners". Baseball-Reference.com. Sports Reference LLC. Retrieved June 19, 2014. ^ "Ryan Braun Statistics and History". ^ "John Axford Statistics and History". ^ "Milwaukee Brewers Managers". Baseball-Reference.com. Sports Reference LLC. Retrieved June 19, 2014. ^ "Milwaukee Brewers Walk of Fame." Milwaukee Brewers. Retrieved on 16 November 2008. ^ "Jerry Royster Managerial Record.". Baseball-Reference. Sports Reference LLC. Retrieved on 2 November 2008. ^ "Ned Yost Managerial Record.". Baseball-Reference. Sports Reference LLC. Retrieved on 2 November 2008. ^ "Dale Sveum Managerial Record.". Baseball-Reference. Sports Reference LLC. Retrieved on 2 November 2008. ^ "Ken Macha Managerial Record.". Baseball-Reference. Sports Reference LLC. Retrieved on 4 October 2010. ^ "Ron Roenicke Managerial Record.". Baseball-Reference. Sports Reference LLC. Retrieved on 14 February 2012. ^ Haudricort, Tom (30 January 2014). "Bob Uecker says he will cut back on workload". Milwaukee Journal-Sentinel. Retrieved 12 April 2014. ^ Heistand, Michael (September 27, 2011). "Family situation keeps TBS' Ernie Johnson from MLB playoffs". ^ Pipines, Tom (19 March 2013). "Matt Lepay to do play-by-play on 35 Brewers telecasts". ^ "Brewers team broadcasters page". Retrieved 13 April 2014.